Bodieite: Mineral information, data and localities. Named for the Bodie Hills volcanic field, in which the Pittsburg-Liberty mine is located, and for the town of Bodie, California, which is about 19 km SSE of the Pittsburg-Liberty mine. 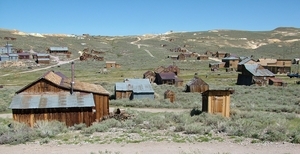 Bodie, a gold-mining boomtown established in 1876, had a population of 5000 to 7000 in the late 1870s. New structure type. 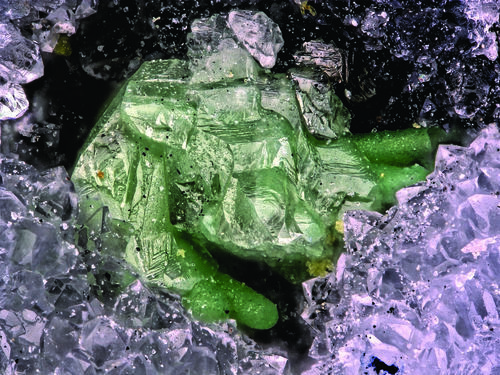 Unique combination of elements: the first mineral being both tellurate (tellurate(IV)) and sulfate (sulfate(VI)) of Bi. 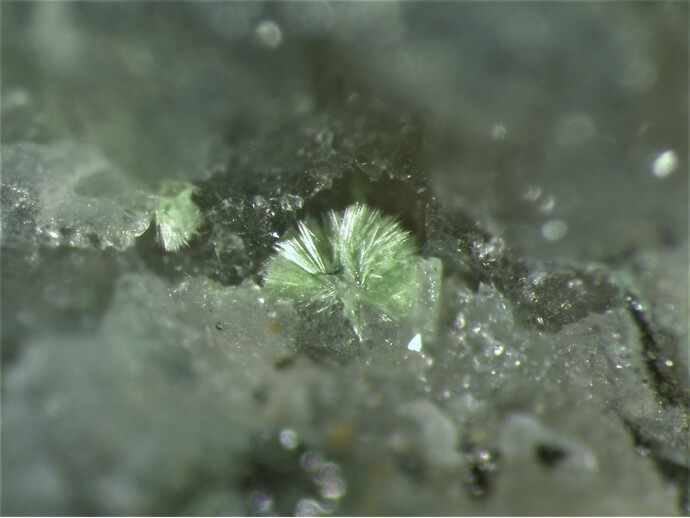 Alters to montanite. Average index of refraction 2.123, from Gladstone-Dale relationship. Kampf, A.R., Housley, R.M., Rossman, G.R., Marty, J. and Chorazewicz, M. (2018) Bodieite, IMA 2017-117. CNMNC Newsletter No. 43, June 2018, 780. Mineralogical Magazine: 82: 779–785. Kampf, A.R., Housley, R.M., Rossman, G.R., Marty, J. and Chorazewicz, M. (2018) Bodieite, IMA 2017-117. CNMNC Newsletter No. 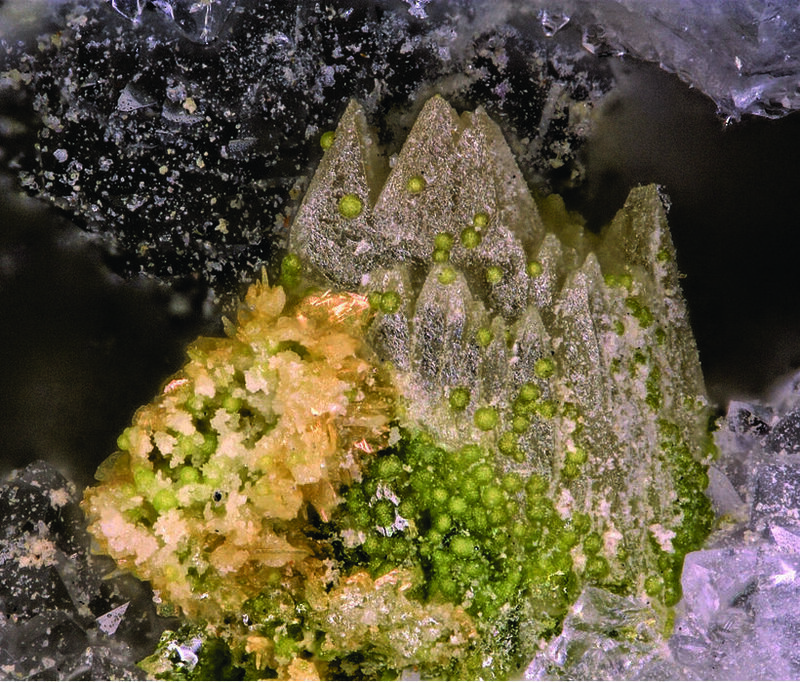 43, June 2018, 780; Mineralogical Magazine, 82: 779–785; Kampf, A.R., Housley, R.M., Rossman, G.R., Marty, J., Chorazewicz, M. (2018): Bodieite, Bi3+2(Te4+O3)2(SO4), a New Mineral from the Tintic District, Utah, and the Masonic District, California, Usa. Canadian Mineralogist, 56, 763-772. In the collection of Brent Thorne. Collected by Dan Evanich.